Since it seems like Vietnamese noodles and rice dishes week in the Wandering Chopsticks test kitchen (Hah! ), I figured it was about time I posted about Com Tam Thuan Kieu in San Gabriel. This is about the location on Valley Boulevard in the Hawaii Supermarket strip mall. There's another location on San Gabriel Boulevard, but I haven't eaten there in years so that'll have to be saved for another post. There's several locations in Orange County too. 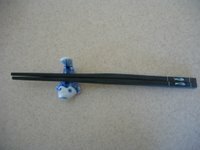 Click on the links to see Elmo of Monster Munching's and Chubbypanda's reviews of the Garden Grove location. Photos are from July. On this day, I met up with Henry Chan's Food Videos on one of our rare Vietnamese restaurant outings. 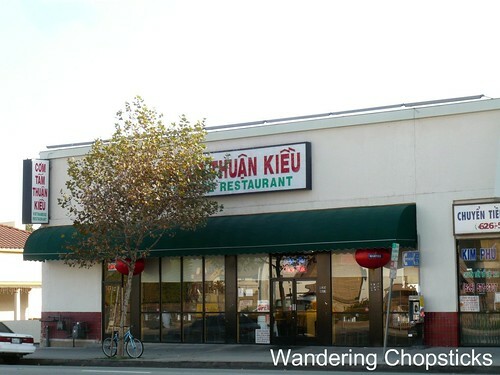 After all, with 650 Chinese restaurants to choose from in the San Gabriel Valley, our default cuisine is usually Chinese. :P Henry was cruising Valley Boulevard (which he frequently does when trying to figure where to eat), when he called me up to help him decide. I suggested various restaurants as he passed each intersection but nothing appealed to him. Until I suggested Com Tam Thuan Kieu. 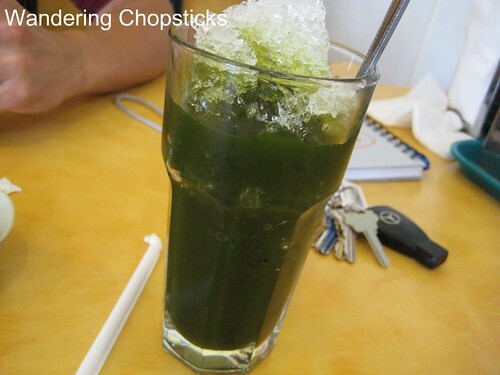 Was it the thought of an icy glass of $1.75 Rau Ma (Vietnamese Pennywort Drink) on a hot day? Or the sides of pickles and cucumbers? Com tam (Vietnamese broken rice) is rice that has been broken during the harvesting or processing. Since it was imperfect, it was cheaper. When cooked, the broken rice has an almost couscous-like quality. You can see for yourself how "broken" the grains are below. As with such things, what used to be peasant food became a beloved dish. 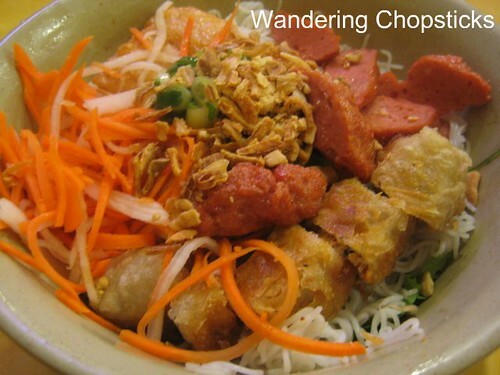 Broken rice restaurants typically also offer bun (rice vermicelli noodles) or banh hoi (steamed vermicelli sheets) and a wide array of meats and appetizers to go with your carb of choice. I generally don't really order off the menu but just tell the waiter which items I want on my plate and the restaurant charges me accordingly. 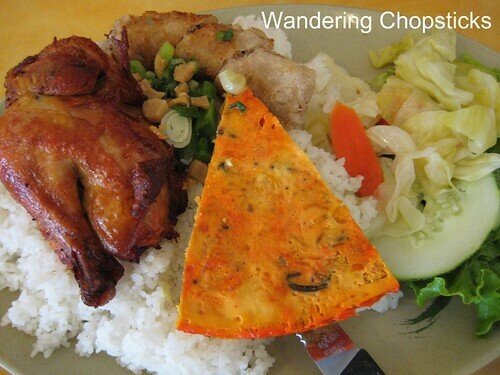 Even then, three items on a platter of broken rice, with clear broth only cost us $5.50. The first item that came out was a small bowl of clear broth. 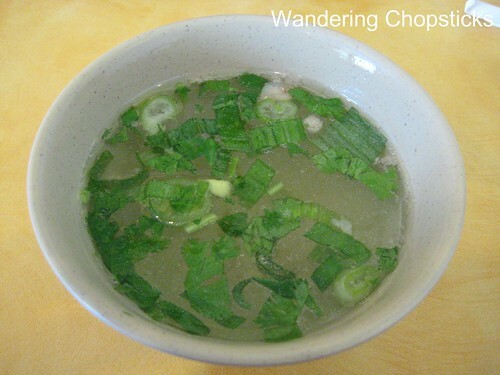 You can drink this as a light soup before your meal or save it and spoon the broth over the rice if you think it's too dry. 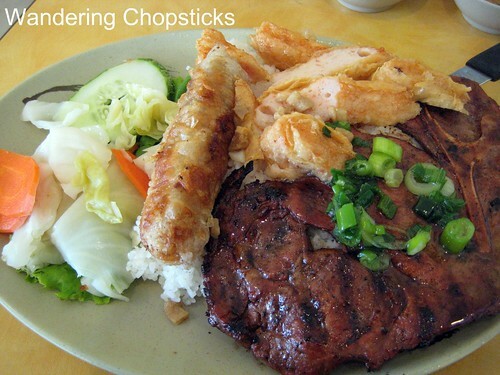 I ordered com tam suon nuong, cha gio, tom tau hu ky (Vietnamese broken rice with grilled porkchop, egg roll, and shrimp paste wrapped in deep-fried bean curd skin). The plate also came with sides of pickled cabbage and carrots, and cucumbers. I recommend ordering the pork chop over the sliced grilled pork because I think it's much juicier. And yes, that pork chop was huge as it encompassed half my platter. Platter folks, not plate. Henry ordered com tam ga ro ti, cha, cha gio (Vietnamese Cornish game hen, omelet, and egg roll). The Cornish game hen had a lovely crispy skin. 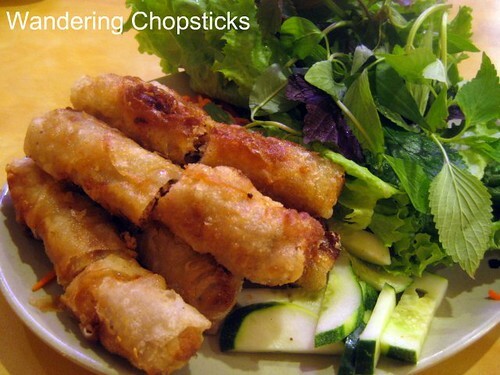 The egg rolls are also very good here because they use traditional Vietnamese rice paper instead of Chinese egg roll wrappers. So I made him order one too because while we shared everything else, one egg roll isn't enough for me. 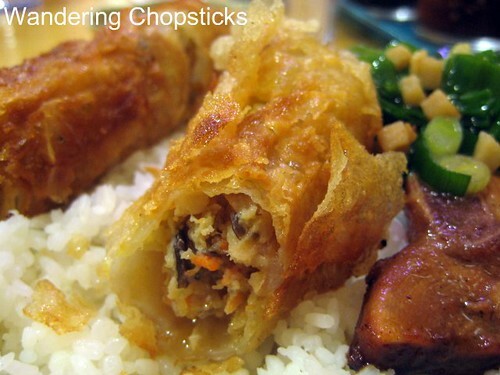 :P You can also order a $4.50 appetizer plate of egg rolls, which comes 5 to an order with lettuce and herbs for wrapping. Henry liked it so much he returned a few days later and ordered the 10 item plate, which you can see on Biggest Menu. On his subsequent visit, the broken rice wasn't as light and fluffy as the first time. So it can be a little inconsistent. What else can I say? It's yummy and cheap. While Com Tam Thuan Kieu's tom tau hu ky doesn't compare to Da Nang Com Tam Tran Qui Cap's version, I think their rice, marinated meats, and egg rolls are well-worth a visit. January 14, 2010 update: Just more pictures from subsequent visits. Bun nem nuong cha gio (Vietnamese grilled pork patties and egg rolls). 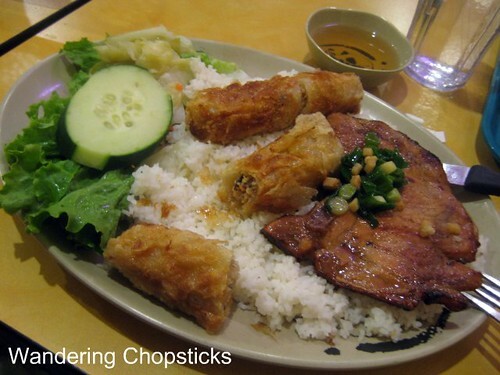 Com tam suong nuong cha gio (Vietnamese broken rice with grilled pork chop and egg rolls). 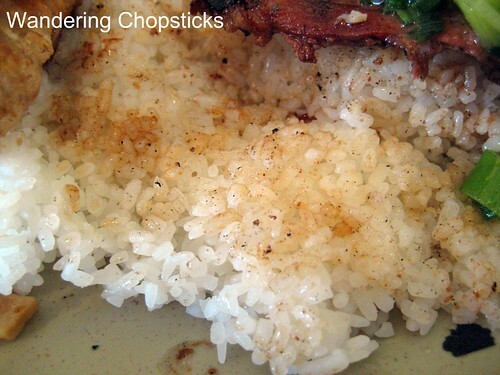 See how frying rice paper has a totally different crispness? Open 8 a.m. to 10 p.m.
You're allowed to park in the Hawaii Supermarket lot, which I would advise. Otherwise, pay attention to the street parking signs as there's restrictions on which time you're allowed to park there. 1 year ago today, dim sum at Mission 261 - San Gabriel. Yummy and cheap? And it's kinda sorta close to where I work. I may have to try a quick lunch here. How funny, I ate com tam yesterday!! It TOTALLY hit the spot after 2 months of being away from CA. Thanks for explaining the broth. I was wondering how I should drink it, haha. I've extended my CA vacation by a couple of weeks because I had an emergency flight after I found out that my aunt had been admitted to the ICU. Yeah, def check the parking signs. We were there on a Saturday afternoon with limited 1hr parking until 3pm or something and we got a ticket RIGHT when we were paying the bill! >_<. We were too hungry to read the signs. I hate parking in Hawai'i supermarket, too crowded. It is similar to otak. It's got meat and is steamed. I told you so! I knew you'd miss Cali. I think the signs just changed again but I can never remember what they were to begin with!